Ammonia also has four electron pairs and the coordination geometry of nitrogen is based upon a tetrahedral arrangement of electron pairs. There are just three bonded groups, therefore there is one lone pair. However since the lone pairs are 'invisible', the shape of ammonia is pyramidal. The geometry of ammonia, NH3. You can use your mouse to manipulate the molecule in the right hand "Jmol" image. Consider a bonding pair of electrons. The two electrons are located between two nuclei, and are attracted by both. A lone pair is different. It is necessarily only attracted to one nucleus and the consequence is that it adopts a position effectively closer to that one nucleus than the bonding pairs of electrons. This means that the effective solid angle occupied by a lone pair is greater than that occupied by a bond pair. Lone pairs demand greater angular room, and are located closer to their atoms than bond pairs. 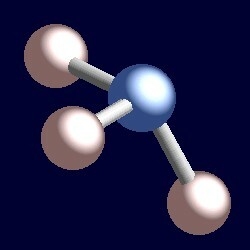 The consequence of this for ammonia is that the lone pair makes room for itself by pushing the three hydrogen atoms together a little and the H-N-H bond angles are slightly less (106.6°) than the ideal tetrahedral angle of 109.5°.